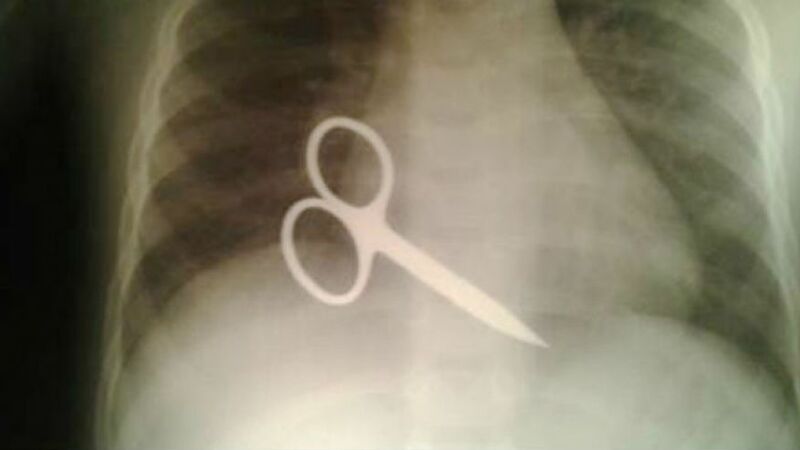 Children have long been warned of running with scissors, but for one boy, the worst-case scenario took a lucky turn, thanks to a neighbor who is an emergency paramedic, reported Central European News (CEN). Sasha Ulyanov, 3, was playing at home with his three sisters when he ran into a wall carrying a pair of nail scissors and stabbed himself in the heart. The children’s mother was out taking lunch to their father, who was working in the field. “Sasha is our youngest child. He was running with the scissors through the kitchen door and misjudged it, and ran into the door frame with the scissors in his hand. He fell to the floor screaming, and our oldest daughter, Diana, who is 15, picked him up and rushed him next door to our neighbor,” the children’s mother, Natalia Baltsyukevich, 35, told CEN. Mikhalchik first ensured the scissors were not disturbed before arranging for Sasha to be transported to the local hospital. Surgeon Dr. Viktor Kovalchuk, head of the department of pediatric surgery at the Medical University of Grodno, and his team removed the scissors from the muscular wall of the right ventricle of the heart, then removed the blood that pooled in the pericardial. The surgery was successful, and Sasha spent two days in the specialist ward before being transferred to the Grodno Regional Hospital, where he was kept in the ICU for seven days. Sixteen days after his injury, he was allowed to return home.